Ah yes, Memorial Day weekend, or as I like to call it, the real start of summer. This weekend, families like mine and yours across the country will gather for the first big barbecues and cookouts of the season, and it’s going to be great. But can it be healthy, too? When it comes to food consumption and overall health, Memorial Day is somewhat like Thanksgiving. Since both are essentially seasonal kick-off celebrations, most people tend to go a little bigger, harder, and more extreme than they normally would on most other occasions. But in reality, Memorial Day can be healthy if you make smart decisions and take advantage of some seasonal offerings—and I’m not just talking about food. I’m keeping my fingers crossed that the long weekend will be sun-filled with warm temperatures. And if it is, I want you to use it as an opportunity to get outside and be active. Go for a walk, hike, bike ride, or get out and do some work in the garden to burn a few extra calories and work on your heart’s efficiency. When you’re at the family cookout or barbecue, play horseshoes, which can help you burn around 200 calories per hour, or touch football to lose around 200 calories per half hour. You can also jump rope with the kids. And if it’s warm enough where you are, you should definitely go for a swim in the pool before eating. A relaxed swim can help you burn 500 calories an hour. Plus it’s a fantastic resistance workout that’s fun at the same time. 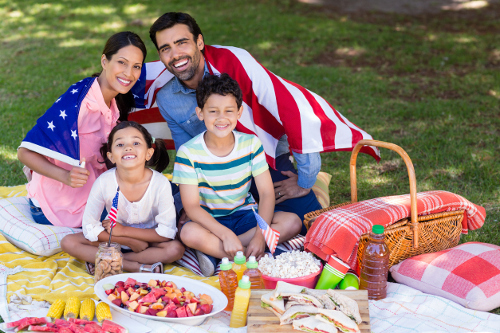 Aside from getting outside and being active, you can maximize your menu by buying seasonal food items depending on where you live for your barbecue or picnic. Make sure you pick up some local produce like green veggies and sweet potatoes so you and your family get those necessary vitamins and fiber. And serve some fresh fruit as a snack or dessert instead of cakes, cookies, and other sweets. When it comes to choosing meats, don’t stress too much over it. Just make sure you stay away from processed items like hot dogs, sausages, and store-bought burgers. To reduce sodium, saturated fats, and calories, opt for turkey burgers, flank steak, sirloin, chicken breast, chicken burgers, fish, or game meats. Do your best to use seasonings instead of sugar-laden sauces, or look for sugar-free sauces that are readily available at most grocery stores. When it comes to unhealthier options making an appearance at the barbecue (it happens! ), remember that you don’t have to eat it just because it’s there. Make your choices for your own plate wisely and in moderation. One big meal at a Memorial Day cookout won’t break your diet, sabotage your health, or have much of an overall impact if you’re responsible. Once you serve yourself a plate of food, eat it slowly and enjoy it. Also, remember that it takes about 20 minutes for your brain to feel the effects of food and signal fullness to your stomach, so allow that time to elapse over the course of a meal. Make sure you stay hydrated all weekend long by drinking plenty of water and limiting boozy beverages to two or three per day. Have a great—and healthy—long weekend!